Calling all foodies! It's doubtful anyone that has visited Turkey has walked away disappointed by the country’s culinary offerings. Turkish cuisine is one of the richest and most diverse in the world. The food, influenced by many civilizations such as Asia, Europe, Africa and the Middle East, has developed over centuries. Food is an integral part of life and a real pleasure for many. Gastronomic tourism refers to taking trips or holidays to destinations primarily to sample and learn about the local cuisine. Recent years have seen a surge of people opting to take culinary tours and tourism figures are benefiting greatly as a result. Global Data suggests that over US $186.8 billion were spent on food by tourists in 2017, and over US $200 billion last year. Food is a big business. Tourists are now more interested than ever before in learning about food culture. Cookery holidays, learn to cook days, organised trips to food festivals or producers, visits to wineries and home cook events are now common all over the world and Turkey is no exception. Chef's, wannabe chef's and those that simply enjoy great food are visiting not only Istanbul and the popular resorts, but also the less well trodden towns and cities to sample and learn about Turkish cuisine. Take a culinary tour of Turkey and you will hear the term 'Anatolian cuisine'. People are, in essence, referring to traditional Turkish food or dishes. Anatolia, or Asia Minor, refers to the Asian side of modern Turkey, across Thrace. This area is large and stretches from the Sea of Marmara, right along the Aegean and Mediterranean coasts, up towards the Black Sea and across to the Eastern boarders. The majority of Turkish destinations we know or visit today lie in ancient Anatolia. Most Turkish food is therefore Anatolian. To better understand the popular regional dishes in Turkey it's best to head for specific cities known for their dishes. As Turkey Homes has said in a previous post, "when we think of authentic Turkish food there is only one place for it - Gaziantep". Tucked deep in the heart of south eastern Anatolia is one of the world's oldest and most fascinating cities. Now classed as a Creative Gastronomy City by UNESCO, the area understandably get's a lot of attention due to its cuisine. It is said that there are more than 400 dishes originating from the region. 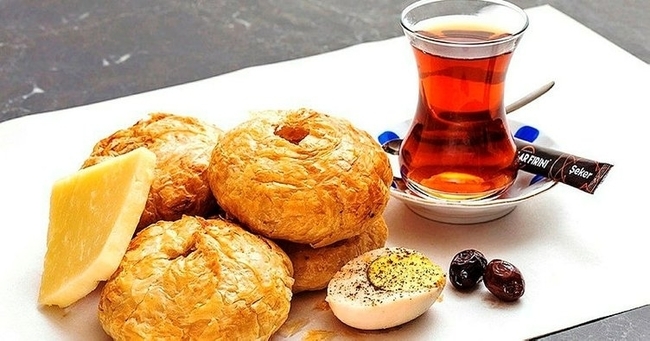 This is not surprising as Gaziantep lies on the ancient Silk Road and its dishes have been influenced by merchants from as far afield as India, Yemen and North Africa. Many wonderful dishes originate from Gaziantep, perhaps the most famous being baklava, a favourite of many and a must-try if ever you are in the area. Meat, meat broth stews and vegetables also star in typical Antep cuisine. Sarimsak kebab (a mouth-wateringly good garlic infused kebab), yaprak sarma (stuffed vine leaves), dolma (stuffed vegetables or sheep intestines), and Beyran Soup (a popular breakfast soup) are also dishes sure to feature on a culinary tour of the area. Hatay is another south eastern region recognised by UNESCO as a World City of Gastronomy. With a history dating back to 9000 BC, the province has hosted many civilisations, its food was influenced greatly by travellers to Anatolia from Persia and the Middle East. Hatay's cuisine is perhaps recognised most by its Arabic flavours. Most dishes from the area are a mix of locally produced vegetables with meat spiced with Middle Eastern herbs. A vast number of dishes originate in Hatay. 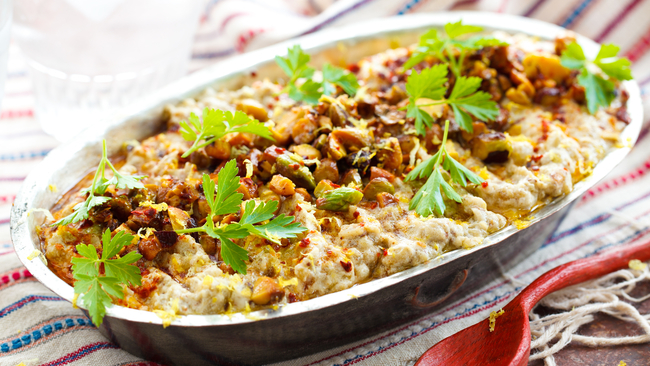 Some of the most well known are Mütebbel, a mix of aubergines, yoghurt and ground sesame, Humus, the popular chickpea dip, and a variety stews and kebabs. For those with a sweet tooth, the popular Ottoman dessert of künefe also comes from Hatay. If you like things a little spicy then Adana is where to head. Located on Turkey's South Eastern coast, Adana's most famous dish is its hot and spicy kebab - a tasty blend of minced meat, herbs and red pepper wrapped around a skewer and served with flatbread and maybe a little bulgur pilaf. But, kebab isn't all Adana dishes up. Lamb and meat stews all distinctly flavoured (and a little spicy) are also regional favourites. Izmir's cuisine has been influenced by many civilisations. It is said that the first ever Turkish cookbook was written in Izmir and that the first King of Greece also compiled recipes from the area. Izmir is where traditional Anatolian cuisine met with Mediterranean influence and then married olive oil. It's where the traditional pulses, grains, vegetable and meat dishes of central and northern Anatolia collided with fish, seafood and produce grown along the fertile Mediterranean coast. Aside from glorious sea bass, squid, crab and fish stews, Izmir is also famous for Izmir kofte, tasty grilled meat and bulgur patties served in a tomato sauce over potatoes, and special pastries called ''boyoz', a breakfast favourite normally served with a boiled egg. Trabzon is another coastal area this time on the Black Sea. 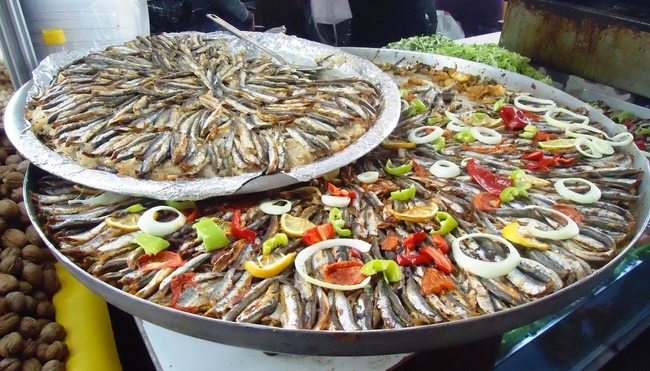 Again, fish and seafood feature heavily in the local dishes with the most famous offering being 'hamsi' or anchovies. Chef's in Trabzon have created many wonderful anchovy dishes, the fresh little fish tasting very different from the pickled affairs you purchase in UK supermarkets. Grilled, fried, served simply or with a sauce, hamsi is a dish all those visiting Trabzon should try at least once. Food tourism in Turkey is a growing sector and one sure to gain in popularity in the coming years. A look online will show numerous options for food tours or culinary experiences in Turkey. Even if you are simply on holiday or visiting your property in Turkey, do be sure to sample some of the regional dishes at a good local restaurant as then you will appreciate that Turkey really does serve up far more than doner kebabs and Turkish Delight! For more information on Turkish food and culture please see the Turkey Homes Blog.